Just one click to prime and prick. The new generation of lancing is here. Inspired by the past, developed for the future. We have built upon our past innovations to create a new 1-Click finger pricker with a drum. Priming and pricking are now combined into a simple 1-Click action, enabling you to lance quickly and experience virtually no pain. 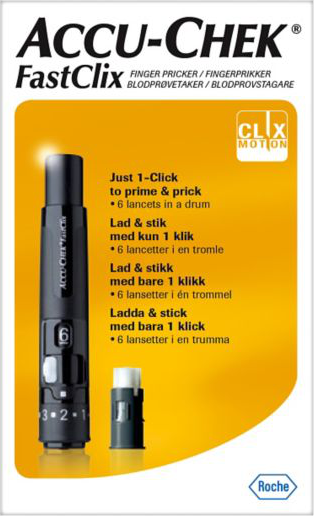 As with our previous finger prickers, Clixmotion technology has also been integrated into the Accu-Chek FastClix finger pricker. Clixmotion technology provides gentle lancing and helps reduce the risk of skin and nerve-end damage. 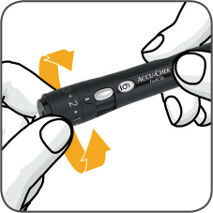 Accu-Chek FastClix - the world's first 1-Click finger pricker with a drum. 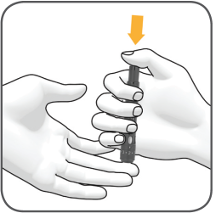 Safety advice: The Accu-Chek FastClix finger pricker is intended for patient self-monitoring by an individual person only. It must not be used to collect blood in a multipatient setting as it does not incorporate any features to guard against cross infection. Prime and prick in 1-Click action. Slide lever back and forth to change. For more detailed instructions, please visit the Accu-Chek FastClix product support page. 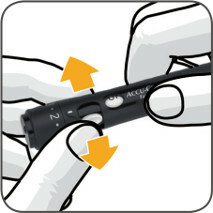 * Dimensions and weight refer to the standalone Accu-Chek FastClix II. Bundled devices may vary. Find out how the DVLA guidelines apply to you.